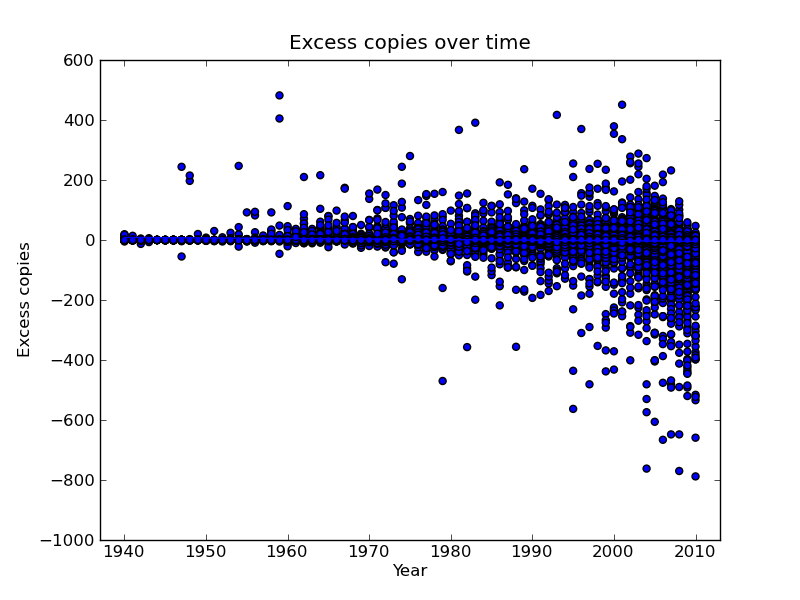 I define "excess copies" as the number of copies put up for trade, minus the number of people who want a copy in trade. 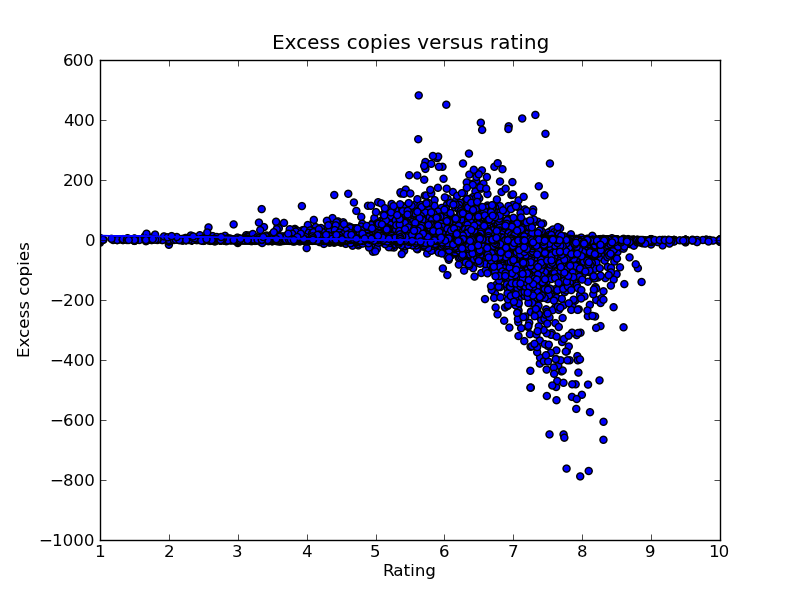 If a game is in demand, its "excess copies" will be a negative number. Newer games are much more in demand. Newer games are also more likely to be available, though a game that's only one or two years old is almost certainly not available. The median game rating is about 6.8. Games with a rating lower than that tend to have excess copies, and games with a rating higher than that tend to be in demand. These games have low ratings but lots of people want them—often because of a media tie-in or prurient interest. People bought 'em, and now they're trying to unload 'em. Some good games you should be able to get cheaply. These games have high ratings, but a substantial fraction of the owned copies are up for trade. Perhaps they lack replay value. These games have strangely high ratings, given how few people own them. I limited this list to non-self-published games published before 2011 and having at least seven ratings. These games are probably out of print or too expensive. Reprinting these games, or coming out with a cheaper edition, would make a lot of people happy. My goal with this list was to find fads that have come and gone, but I don't think it worked. Most of these games are in the oldies-but-goodies category. Lots of people are offering to trade these games, and lots of people want them. They're not rare: just about everyone who wants a copy could get one. But for some reason, the market isn't clearing. Apparently people don't want these games as badly as they think they do. These games are on lots of wishlists, and they're available for trade, but nobody actually wants to take the "receiving" end of the trade. This document (source) is part of Crummy, the webspace of Leonard Richardson (contact information). It was last modified on Monday, August 13 2012, 12:10:37 Nowhere Standard Time and last built on Saturday, April 20 2019, 16:00:39 Nowhere Standard Time.